Piercy Machine Inc., has always strived to provide quality products at an affordable price with quick turn-around. CNC and manual machines to produce production runs, proto-types and custom machined parts. CAD/CAM software is used to create blueprints, detailed drawings and solid parts to generate NC programs in the most efficient way. We are here to assist you in the design and engineering of your parts, whether from your blueprints or just your idea of what you need. As a full service machine shop, we can also reverse engineer / recreate or repair parts that may no longer be available. 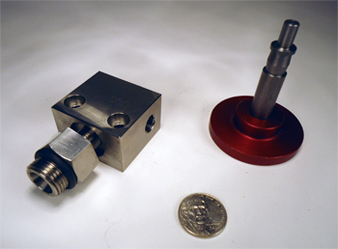 Consider us to run your part to completion or let us provide quality blanks for your machining process. Drawing / Programming - Currently uses BobCad software for design and programming basic to complex parts that require multiple operations. Each job is planned with efficiency and quality as our focus. Milling - 3 Axis machining center with add-on programmable indexer for 3 1/2 axis. 8K rpm spindle with 280psi through tool coolant. Pockets, drilling, rigid tapping, profiles, facing, circular interpolation, and some 3D contouring. Capable of holding tolerances of +/- .0005". Turning - 2 axis lathe turns up to 6 in diameter 14in length. Single point threading, tapping, drilling, tapers and contouring. Bar puller to run small parts automatic. Drilling - CNC drilling, manual drilling. Circle patterns, blind hole, reaming and deep hole drilling. Tapping / Threading - We cut threads, form threads and have thread mills for super fast threading. We check all threads with ring gauges, plug gauges or thread mics to ensure proper dimensions. Bore / Honing - We are equipped with: boring heads, reamers and burnishing tools to create smooth finish on ID surfaces when required. Deburing / Finishing - Parts tumbler with ceramic media, removes burrs, cleans and creates a uniform finish. Several types of media for different materials and parts. Deburring wheels and belt sanders to remove sharp edges and burrs and clean surfaces. Bead blaster for preparing material for welding and other operations. Welding / Fabrication - TIG, MIG, and brazing. We weld steel, aluminum and stainless steel. 48" bending break, 18" press break for forming lips and bends.